We now have what we call QUICKPRINTS! For those times you need it quickly! When ordering any of our QUICKPRINTS just let us know you need it QUICKLY. With artwork or files that are ready to print we can produce our QUICKPRINTS between 2 to 48 business hours. There are restrictions to each product (available stocks, methods, finishing options, etc.). Next time you need it QUICKLY ask about our QUICKPRINTS! Need some inspiration? Want to see what we have to offer? Contact us today for a sample pack! Our sample pack explores a variety of different printing options and paper samples. 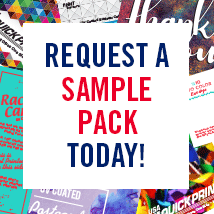 Click here to request your sample pack! This July save on color copies! 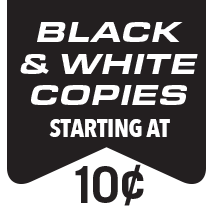 Color copies starting at 39¢. Perfect for those looking to get a small quantity at a large quantity price per piece! Some restrictions may apply, ask for all the details. Our color of the month for June 2018 is PMS 201 Burgundy! Mention this for no additional charge for wash up on this month’s color throughout the month of June. Great option for one color business cards, coupons and flyers. Upgrade to 20# Hammermill Salmon stock for no additional cost. Great for flyers, coupons, and much more! For the month of June 2018 save on Flyers! 8.5 x 11 Full Color flyers, prints one side on 100# Gloss Text or 32# Uncoated White Stock. Basic Setup included. 8.5 x 11 Grayscale flyers, printed one side on 60# Astrobright Text with your choice of paper color. Basic Setup included. This month you can purchase a 2′ x 4′ Banner for $25.00. The material is a 13oz outdoor/indoor vinyl. The special is for full color ink, one sided, with four grommets. Hemming and bleeds are not included. For banners that require hemming and/or bleeds the size will be adjusted to 22″ x 48″ at no additional cost. Art setup is not included. We accept many different file formats! Want us to set it up? Basic setup is an additional $10.00. This would be the perfect for graduation banners, birthday party banners, trade show banners, and much more. Some restrictions may apply! Our color of the month for May 2018 is Reflex Blue! For the Offset Press: Mention this for no additional charge for wash up on this month’s color throughout the month of May. Great option for one color business cards, coupons and flyers. For the Digital Press: Upgrade to 20# Hammermill Blue stock for no additional cost. Great for flyers, coupons, and much more! 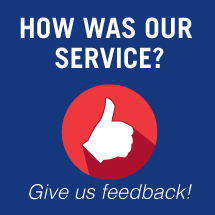 Grab your customers attention and get results with a new Rack Card or Postcard! 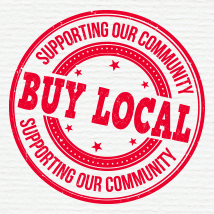 Create a new marketing tool and inform people of what your business can do! This month order 250 Rack Cards or Postcards for $80.00! Prints two sides on a premium 14pt coated stock with a gloss UV Coating on the front. The postcard is 4″ x 6″ and the rack card is 8.5″ x 3.5″. Choose your marketing tool and order today. Need us to design it? No problem… we can do that. Or take advantage of the free templates on www.canva.com. Restrictions may apply, contact us today to place your order! You can order online, email us, call us, or stop in!